So, I have been having some (alot) of trouble accepting that is actually fall and winter will be here way too soon. I was gone for three weeks and when we came home to Colorado fall was here full force. The leaves on the trees are full of colors, the mornings are getting nippy, and my first grader has fall break. I know that fall had to come and there was nothing I could do about it, but I really am more of a summer girl. 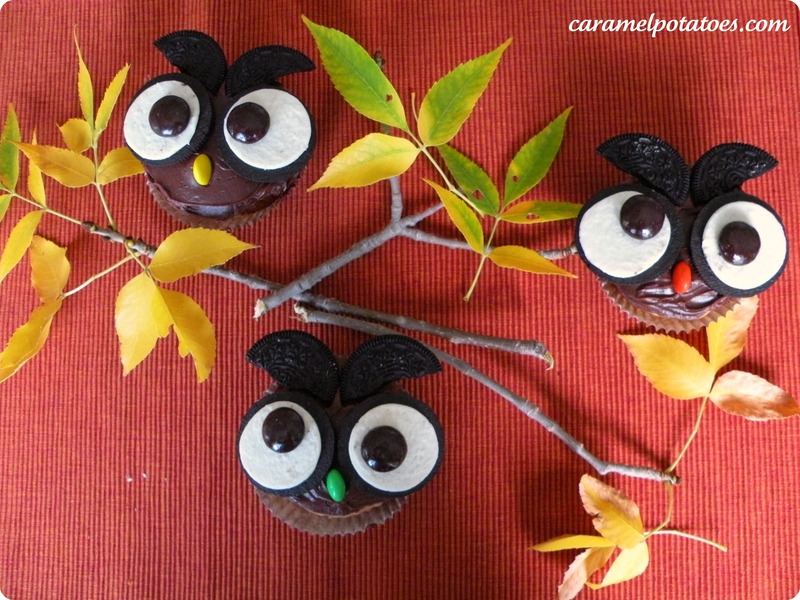 To get me going on my fall foods I decided we just had to make these adorable owl cupcakes. These are so simple; kids will love to make their own owl. Another great thing about them is you can use your favorite cupcakes. Collect the cream-less cookies to use for the ears. Break the cookies in half. Match up cookie halves with another of similar size. Use a knife to smooth chocolate frosting onto the tops of the cooled cupcakes. Place the cream sided cookies, cream side up, on the middle of the cupcakes, making sure that the eyes are oriented the way you want. Press gently. To make the ears, attach the broken cream-less cookies to the cupcakes above the “eyes”, textured side facing up and round edges inward. These should hang over the edge of the cupcakes, but be sure to press them into the frosting where possible to make sure they adhere well. Lastly, press 1 M&M on its side between and slightly below the cookie “eyes” as beaks. Now marvel at how ridiculously cute these are. These look fabulous – thanks for sharing. I will have to mkae these for my kids! These are so adorable I’m not sure I would ever want to eat them. I would love it if you would stop by and share at the crafty link party going on right now at Lines Across My Face. Thanks for sharing. I am featuring these on my facebook page today. Oh my goodness, these are too cute! Oh, my! These are adorable! I’ve always loved owls even before they were “in” – thanks for sharing this, it does look easy enough for even me to make! I love these! I’m adding them to my pinterest, I hope that’s okay! Of course it’s okay – We love Pinterest! Thanks for stopping by! I’m over from the Halloween Entourage Hop. Huge owl fan here. Love these and have no one to make them for, but will make them for myself. My dad would like them, but I’m not shipping them from Dallas to Wisconsin. LOL Maybe, I’ll make them next time I go home to visit. 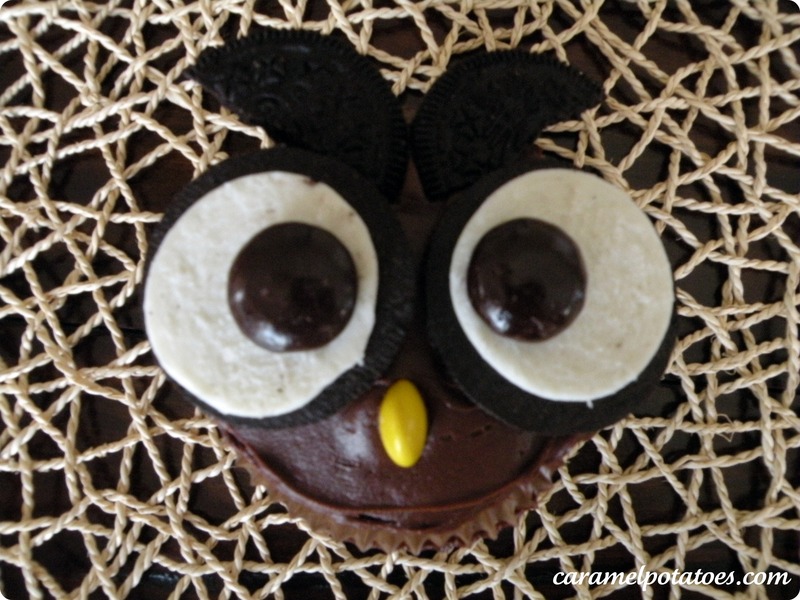 He is an owl nut and loves cupcakes. 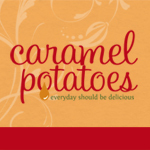 Hope to see you hop on by my blog. I have plenty of Halloween related posts. I am a dark fiction writer. My blog is about books and writing, in all genres.